I will finally be releasing The Man Who Was Afraid of Falling online on Monday 15th April. The film will be up on my Vimeo page where you can find most of my other films. After more than a year on the festival circuit the film has been screened at over thirty five festivals internationally including Stuttgart International Festival of Animated Film, Anirmau and Encounters International Short Film Festival. The film has won four awards including 'Best Up and Coming Talent Award' at Canterbury Anifest and 2nd Prize Royal Television Society Student Animation Award. 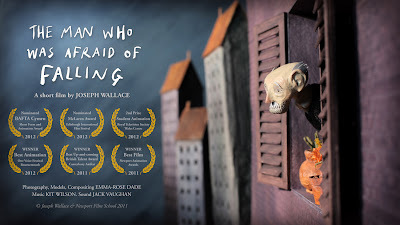 It's been nominated for a further eleven awards including a BAFTA Cymru 'Short Form and Animation Award', the 'McLaren Award for New British Animation' at Edinburgh International Film Festival and was also shortlisted for the British Animation Awards. One of the best things about video games is that there are enough of them for everyone to enjoy. However, there are some types of games that are only suitable for certain age groups, and are listed as such. You'll know which games are suitable for the members of your household if you remember the contents of this article. A BAFTA Cymru nominated, award winning short animation directed by Joseph Wallace. All original material © Joseph Wallace 2012 unless otherwise stated. All rights Reserved.